Symrise is one of the most sustainable companies in Germany. As global supplier of fragrances, flavors, cosmetic active ingredients, functional ingredients, as well as sensorial and functional solutions, Symrise has global supply chains. Its clients include manufacturers of perfumes, cosmetics, food and beverages, the pharmaceutical industry, producers of nutritional supplements and pet food as well as baby food producers. By actively engaging in sustainable production of vanilla in Madagascar, Symrise developed a prototype for sustainable value creation. 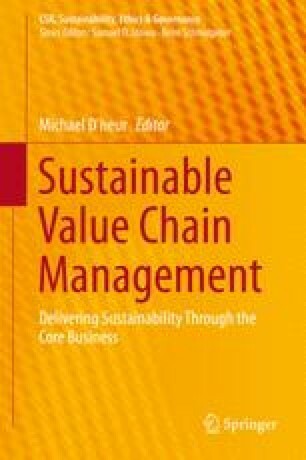 This article illustrates how the idea of sustainable value creation is being applied in the vanilla value chain and how it creates shared value for all. CITES. (2013). Convention on international trade in endangered species. http://www.cites.org/. Accessed June 11, 2013. Deutscher Nachhaltigkeitspreis. (2013). http://www.deutscher-nachhaltigkeitspreis.de/1328-0-Startseite_2013.html. Accessed June 11, 2013. GIZ. (2013). Gesellschaft für Internationale Zusammenarbeit. http://www.giz.de/en/. Accessed June 11, 2013. GRI. (2013). Global reporting initiative. https://www.globalreporting.org/languages/german/Pages/default.aspx. Accessed June 11, 2013. SEDEX. (2013). http://www.sedexglobal.com/. Accessed June 11, 2013. Symrise. (2013). http://www.symrise.com/uploads/media/SYM_Unternehmensbericht_de_130311_01.pdf. Accessed June 11, 2013. UN. (2013). UN global compact – Communication on progress. http://www.unglobalcompact.org/COP/. Accessed June 11, 2013.